View More In Nursing Covers. Bb au Lait Nursing Covers and Burp Cloths are practical yet stylish new-baby basics. Bundled together, they are perfect for gift-giving! 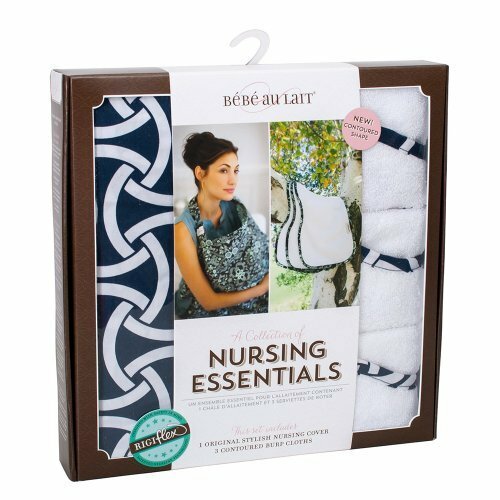 Each Nursing Essentials set includes 1 Bb au Lait Nursing Cover and 3 Contoured Burp Cloths. Bb au Laits award-winning Nursing Covers are the only Nursing Cover with a patented Rigiflex neckline, which holds the cover away from mom and baby, promoting airflow and allowing eye contact so mom and baby can continue to bond while breastfeeding. With over 20 stylish patterns to choose from, theres a Bb au Lait to fit every new moms style. Bb au Lait Contoured Burp Cloths are a newborn must-have. Made of ultra-soft and absorbent cotton terry, these Burp Cloths protect your clothes from any surprise baby has in store. The contoured shape provides full coverage: fitting side-to-side and front-to-back. Bonus! Use as a Burp Cloth during the newborn months, then as a luxuriously soft wash cloth later. Rigid Neckline allows for ventilation and direct eye contact with baby. Burp cloths are contoured and large enough for full front to back coverage. Piping on outside of burp cloths matches designer print on nursing cover. Internal Terrycloth Pocket: Perfect for quick cleanups and stashing breast pads and pacifiers. If you have any questions about this product by Bebe au Lait, contact us by completing and submitting the form below. If you are looking for a specif part number, please include it with your message.